The dust has all but settled from the Ducks’ historic 2014-15 season featuring a trip to the inaugural College Football Playoff, a Rose Bowl victory, and the first Heisman trophy winner in school history. It is time to look ahead to the 2015-16 season and retool for another National Championship run. Mariota throws a pass in the National Championship Game. The biggest concern facing this squad as they take the field September 5 against Eastern Washington will be the gap left by arguably the greatest football player to ever suit up for the Ducks, Marcus Mariota. After losing a player of this caliber, sports analysts around the nation are predicting the Ducks to take a step back this year, and why wouldn’t they? Given recent history, the last five programs to have a Heisman Trophy-winning quarterback leave their school (not including Florida State, because they have yet to play a season following Jameis Winston‘s departure) have failed to reach the same win total the following season with a new signal caller under center. 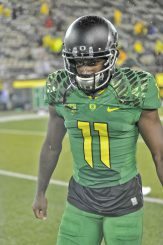 The return of Bralon Addison adds a new dimension to the next man up at quarterback. The problem this trend poses to the Ducks is that with a little help from a few of the incoming freshmen on the defensive side of the ball, this team is built to win now. The Ducks are getting their best receiver back from injury in Bralon Addison, to join wide receiver standouts from last season Devon Allen and Darren Carrington III. With returning veteran running back Thomas Tyner, freshman sensation Royce Freeman, and senior-to-be play-maker Byron Marshall thriving in the infamous TAZR position, this offense is loaded with playmakers talented enough to dominate games. Throw in some contributions from the highly touted running back and wide receiver recruits and this could be one of the most deeply talented rosters the Ducks have had in recent memory. But the question still remains, who is going to be the quarterback to fill Mariota’s gigantic shoes and put it all together? Without an answer at the quarterback position the Ducks may be doomed for a disappointing (by recent standards) season. But there is hope. One team in the last 15 years has lost its Heisman trophy winning quarterback, and gotten better. The 2003 USC Trojans. In 2002, Carson Palmer led the Trojans to an 11-2 record while passing for 3942 yards with 33 touchdowns and 10 interceptions en route to a Heisman trophy. That season ended in a victory in the Orange Bowl and was by all accounts an extremely successful season. Palmer then graduated from USC and entered the NFL Draft as one of the top quarterback prospects in the game. Sound familiar? With Palmer, who had been the Trojan starting quarterback for the previous 3 years then gone, the Trojans were left searching for a new starting quarterback. In came the inexperienced Matt Leinart, who was widely considered a step down from Palmer. However, in his first season as a starter, Leinart threw for more than 3500 yards and 38 touchdowns leading the Trojans to a 12-1 season, ending with a commanding victory over Michigan in the Rose Bowl. Vernon Adams put up spectacular numbers against Oregon State and Washington in the last two years. I would be almost certain that the Ducks are the prime candidates to be added to the list of teams with a post-Heisman slump, if not for one thing. 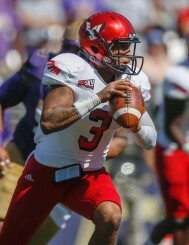 The transfer of Eastern Washington quarterback Vernon Adams Jr. One thing in common with the list of teams that went through a post-Heisman slump is that all of the quarterbacks who took over their respective teams were widely inexperienced. This is how the Ducks separate themselves from the pack, and this is how they will thrive in 2015. Instead of having an inexperienced quarterback take over this Lamborghini of an offense, all signs are pointing to the senior transfer being the guy under center come September 5, starting against his former team, and he is a player who has thrown for 10,000+ yards in three collegiate seasons with 110 touchdowns and only 31 interceptions. Coach Mark Helfrich and his staff have handled this situation perfectly (surprise, surprise) having an experienced veteran come in to distribute the ball to the talented playmakers while young prospects Travis Waller, Morgan Mahalak, and Ty Griffin get another year to learn the system before battling it out for the starting nod in 2016. And if one of the youngsters — or Mariota’s backup, Jeff Lockie — wins the starting role, even better, because whoever does it will have beaten out a veteran starter, and Plan B will be better than most teams’ Plan A. 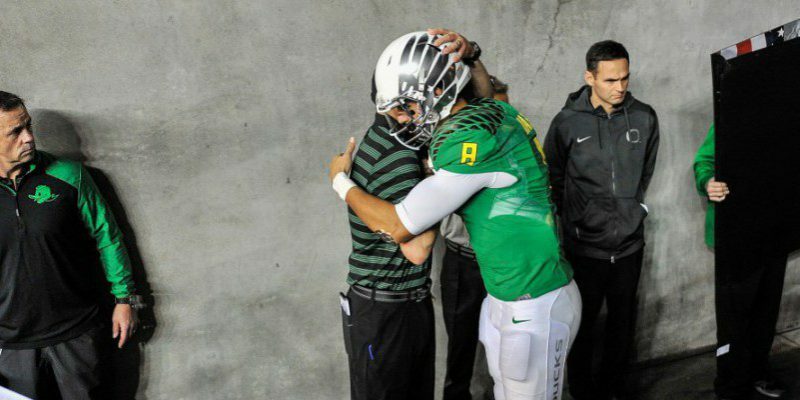 The Ducks are losing the greatest football player in the history of the program, but thanks to Coach Helfrich and his staff, they won’t miss a beat. AuburnBaylorCam NewtonFloridaJameis WinstonJeff LockieMarcus MariotaMorgan MahalakOklahomaRobert Griffin IIISam BradfordTexas A&MTim TebowTravis WallerTY GRIFFINVernon Adams Jr.